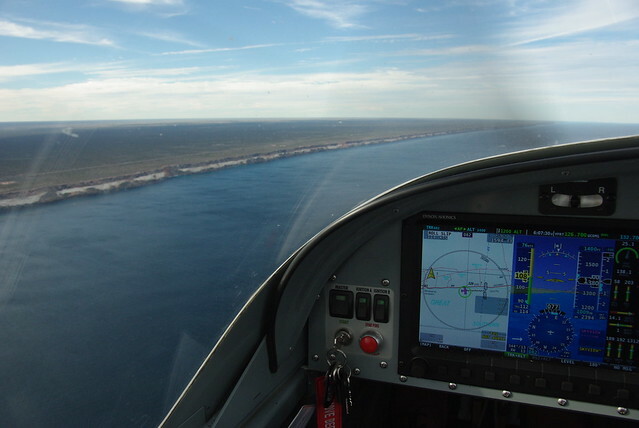 I recently flew my RV-12 from my home airfield near Perth in Western Australia, east along the coast into South Australia, and then up into the Northern Territory, finally coming back home through the`top end' of WA. While it's hard to complete with Vlad when it comes to informative and entertaining trip write-ups, I thought the unique country down here might justify the attempt. 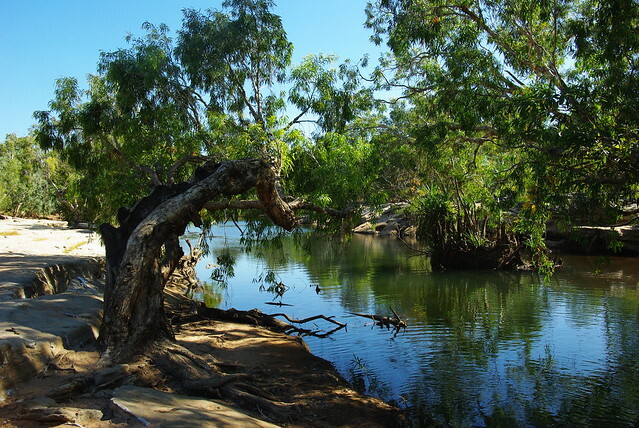 The plan was to visit my daughter and son-in-law who were recently posted to the small town of Katherine in the Northern Territory, about 300 km SE of Darwin. He's in the RAAF and works on the FA-18 Super Hornets that are based at Tindal, just outside Katherine. Tindal is military air space, but the airfield also accommodates civilian aircraft, so I was able to land there. US and other foreign military aircraft often operate out of there when staging or participating in joint exercises. 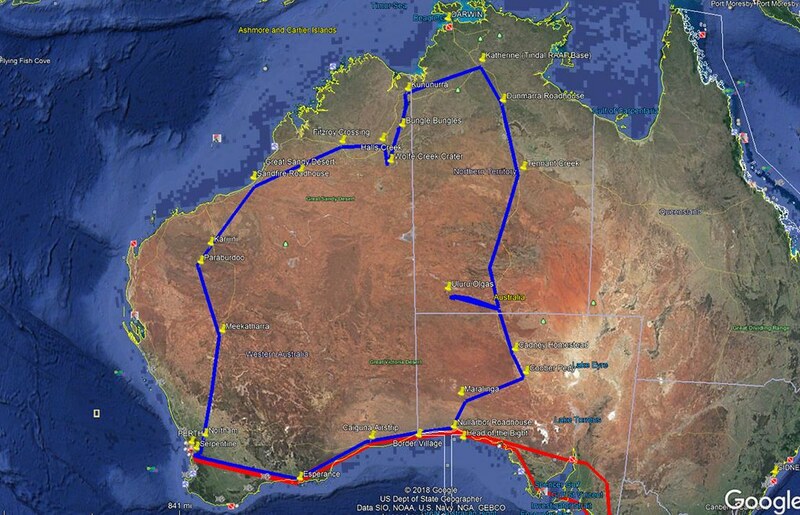 I covered about 4,300 nm over a four week period including a couple of weeks in Katherine. 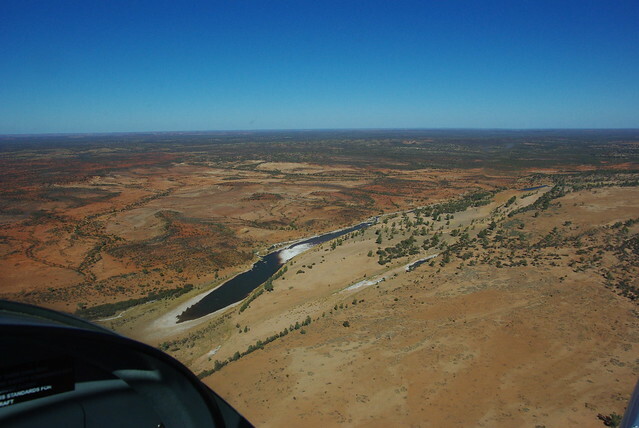 Much of this part of Australia is classified as a Designated Remote Area requiring you carry appropriate survival gear and ELT/PLB or HF radio. 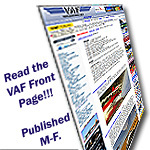 Airstrips and refuelling facilities are typically few and far between, so you need to plan accordingly. My RV-12 has a modified fuel tank with just over 25 gal capacity, which gives at least 4 hours endurance plus reserves. 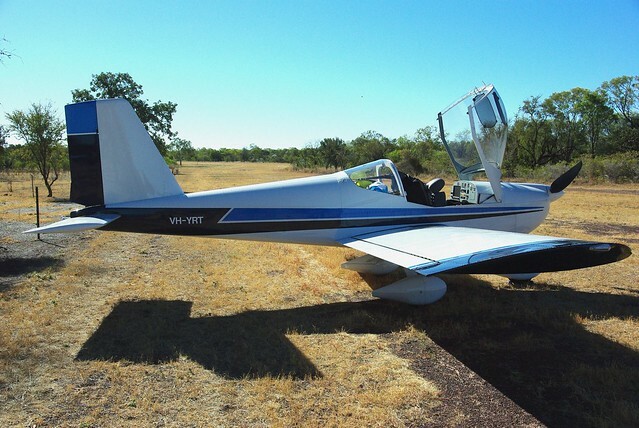 With this setup, the RV-12 is a very practical aircraft for travelling in this part of the world. The route is marked in blue, travelling anti-clockwise to make use of the prevailing winds. (The red line was a trip I did in 2016). 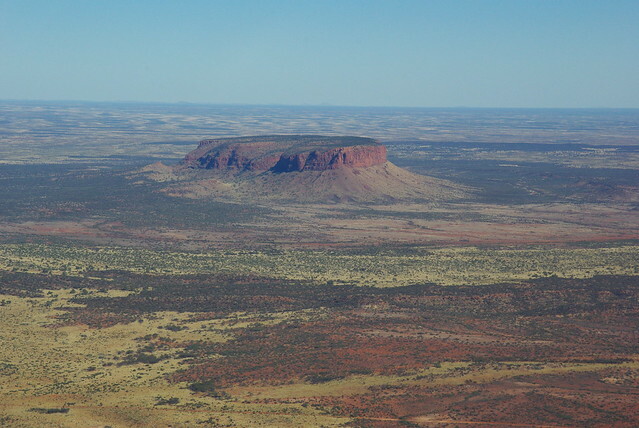 It's clear from the map why this part of the country is often called the `Red Centre'. Unique rock waterholes near Esperance on the south coast of WA. 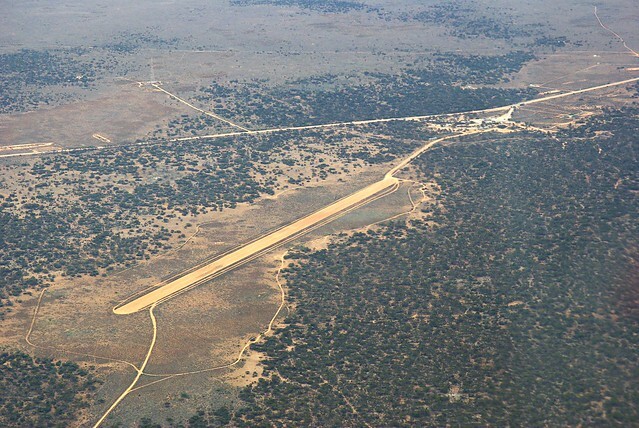 A typical outback airstrip on the Nullarbor - largest treeless plain in the world. 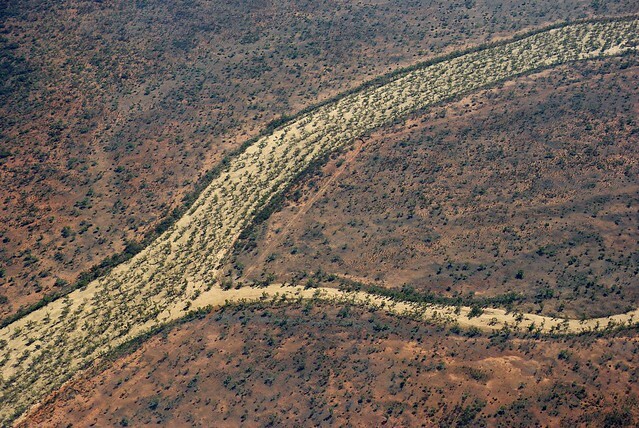 This is the strip at Caiguna, a roadhouse at the eastern end of what is regarded as the longest straight stretch of road in Australia and one of the longest in the world. The road stretches for 146.6 kilometres (91.1 mi) without turning, and is signposted and commonly known as the "90 Mile Straight". These strips may not be useable after rain, so it's a good idea to ring ahead before taking off to avoid any nasty surprises. There's always the highway that could be used in an emergency. In fact the RFDS (Royal Flying Doctor Service) has several airstrips marked on isolated sections of the highway where police and ambulance services coordinate to enable patients, usually traffic accident victims, to be flown to hospital. Cruising along the cliffs at the southern edge of the continent. These cliffs are up to 300 feet high. The head of the Great Australian Bight. 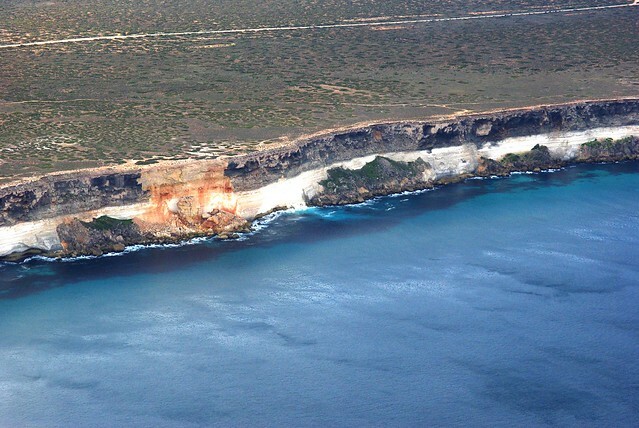 The most northerly part of the southern coastline and the end of the Nullarbor cliffs. Also a whale breeding ground. I saw about nine whales close inshore under the cliffs. Parked outside the motel units at Nullarbor Roadhouse, my most easterly stop before heading north into the desert. 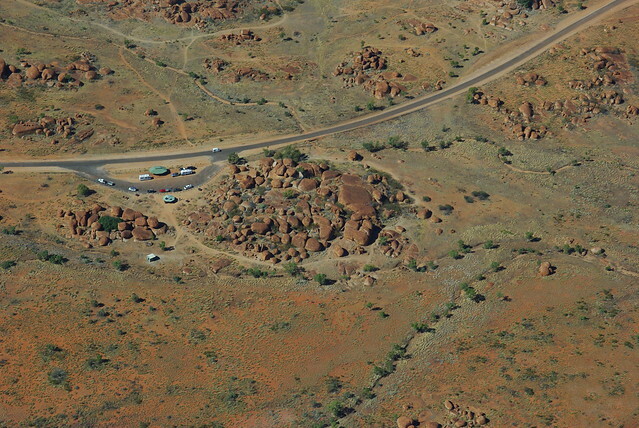 These roadhouses usually have camping grounds and other accommodation available. Aircraft that use Mogas sometimes taxy around to the fuel bowsers and queue up with the cars to refuel, but I preferred to carry my fuel rather than battle with the other traffic. Maralinga - site of the British atom bomb tests in the 1950's and early 60's. Apparently the Brits didn't have a backyard big enough, so they came and used ours! There is a beautiful sealed runway visible in the distance, but you need permission to land there. 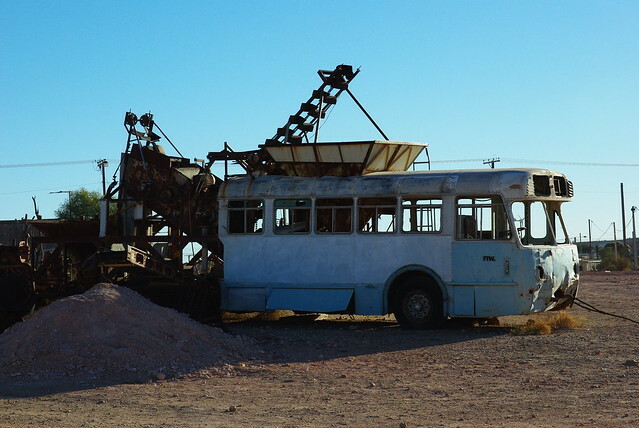 Coober Pedy - one of Australia's richest opal mining centres. 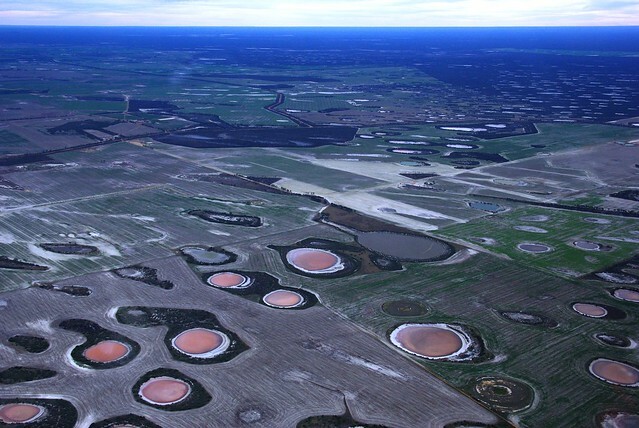 The area resembles a moonscape with hundreds of mineshafts and spoil heaps. Many people have made comfortable homes underground, and you can even stay in an underground motel if you like. 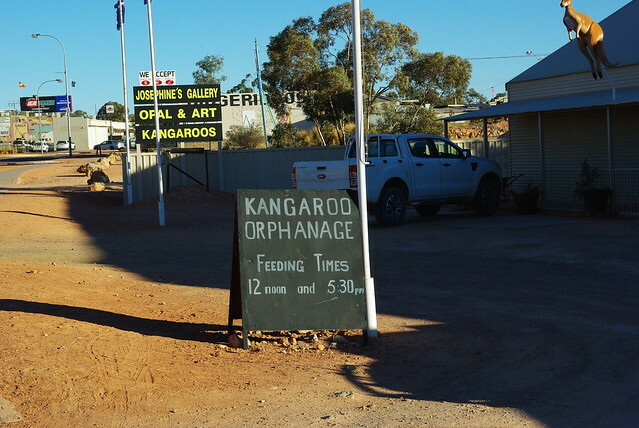 Leaving Coober Pedy, I flew north to Cadney Homestead, another roadhouse. The Cessna in the background flew in later. 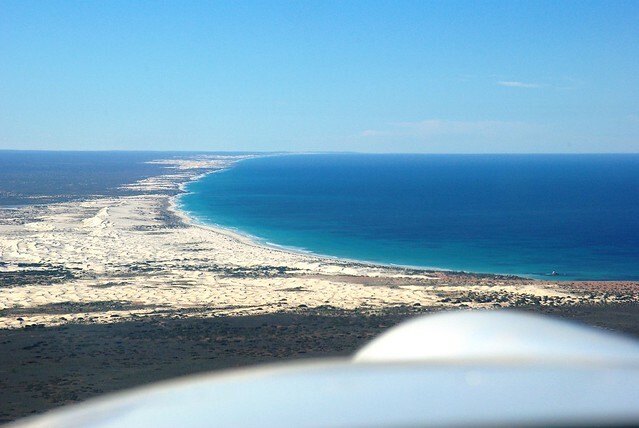 The pilot turned out to be Louis Helbig, a well known Canadian photographer now living in Australia. He was on a trip to photograph landscapes, and we crossed paths several times in the following days. Caravans and RV's parked for the night at the Homestead. These travellers are mostly retirees touring the country and are commonly known as `Grey Nomads'. From there I flew to Kulgera, yet another roadhouse just over the border in the Northern Territory, and did a trip the next day to visit Mount Connor. 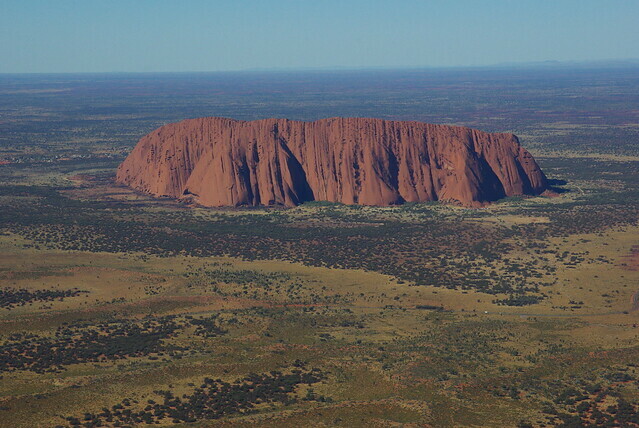 ...and Uluru, or Ayres Rock as it's otherwise known. ... and the Olgas. Pilots get all the best views! Last edited by rgmwa : 08-04-2018 at 10:27 AM. 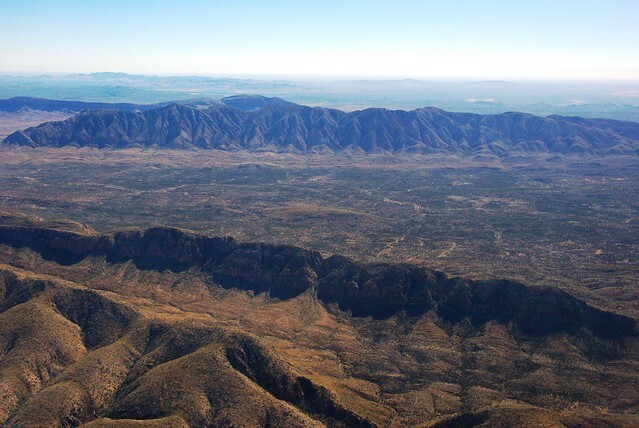 Flying from Kulgera to Ti-Tree township, passing to the west of Alice Springs, and over-flying the MacDonnell Ranges. Highest peak here is around 4,500'. In fact our highest mountain, Mt Kosciuszko is only 7310'. 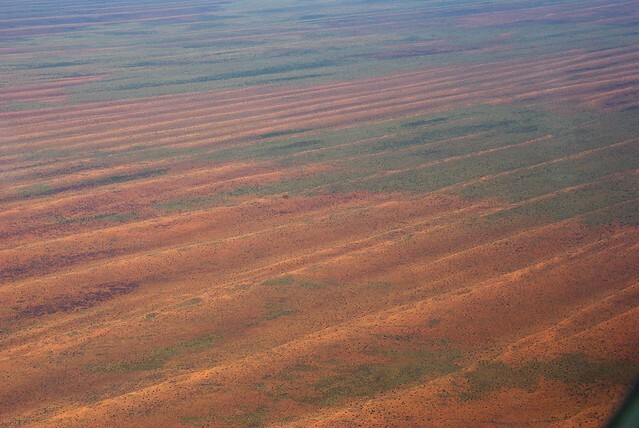 Fly at 7,500' and you won't hit anything in Australia, but there are few places for a safe forced landing in this area. Further north still, and you reach the Devil's Marbles, an unusual rock formation where huge granite boulders are piled one on top of the other. The country out here is pretty desolate and rainfall is low. Rivers are seasonal, if they run at all. 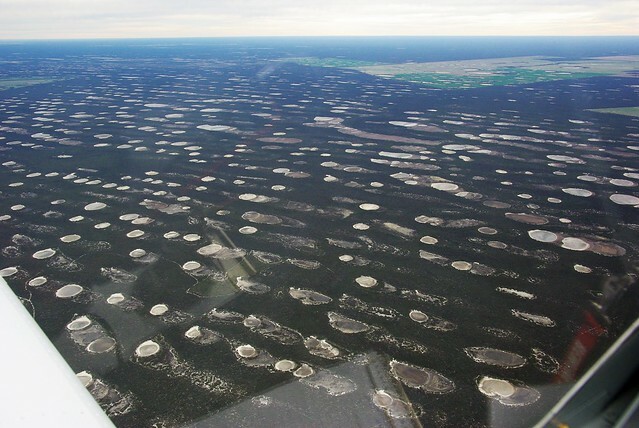 However, they create interesting patterns when seen from the air. 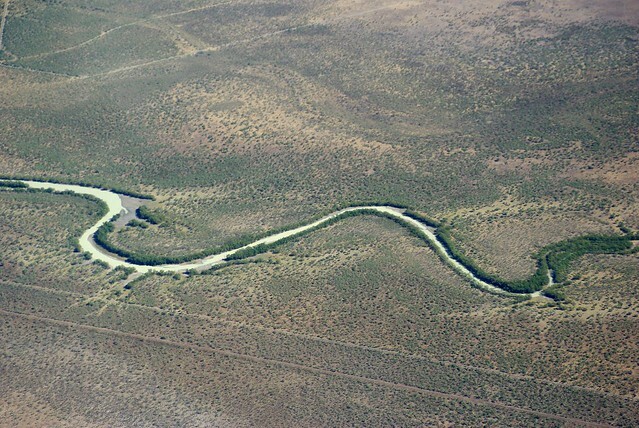 ... and there are also occasional pools of water in the otherwise dried-up river beds. Very occasionally you see signs of permanent habitation. This is one of the cattle station homesteads, which would be called ranches in the US. 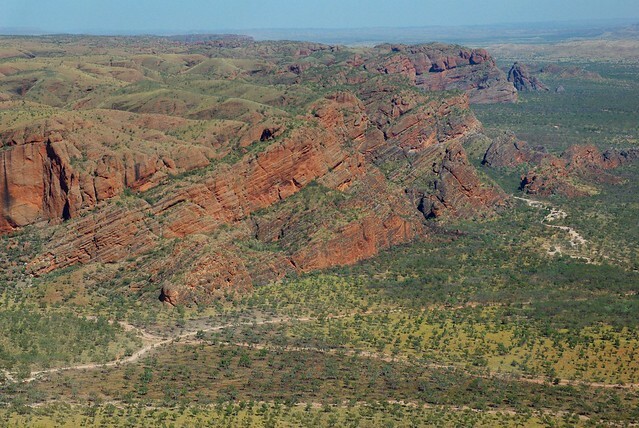 Anna Creek Station in Western Australia is the largest in the world at 9142 sq miles, more than 7 times larger than King Ranch in Texas, the biggest in the US. 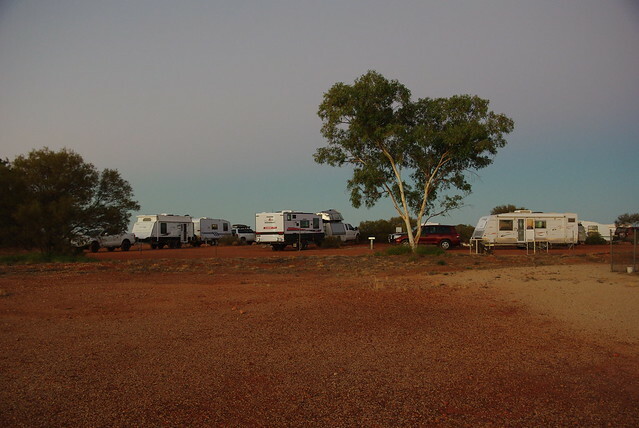 My last overnight stop before reaching Katherine was Dunmarra Wayside Inn. This roadhouse, like the others I stopped at after leaving the south coast, is on the Stuart highway which runs from Adelaide in the south to Darwin in the far north. Anything further than five nautical miles either side of the highway is defined as Designated Remote Area. The strip at Dunmarra is carved out of the surrounding bush, and you have to keep an eye out for cattle, kangaroos and other animals that may wander out of the bush. After I landed, a buffalo and her calf strolled out of the scrub, looked me over, apparently decided I wasn't a threat, and grazed their way down the strip. Last edited by rgmwa : 08-04-2018 at 08:37 PM. After two weeks with the family it was time to move on. Being this far from Perth, it was preferable to simply keep going around rather than re-trace my steps - more new things to see and generally more favourable prevailing winds. July is a good time to travel in this part of the country. Later in the year, it's hot and humid, and the coastal areas in particular experience cyclones and massive thunderstorms. No place for a light plane to be on a bad day. First stop was Kununurra, just south of which is Lake Argyle. 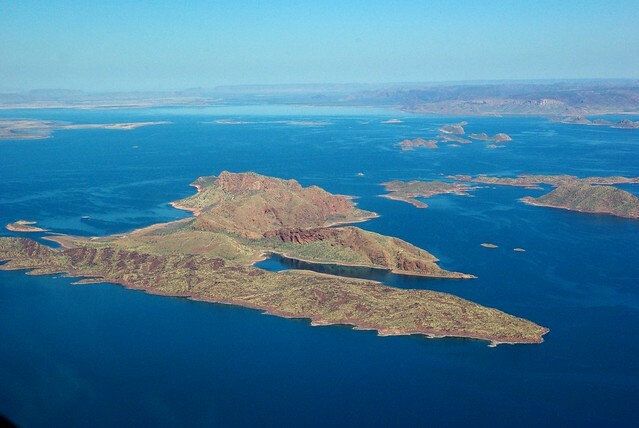 This is the largest reservoir in Australia, created by damming the Ord River. At full capacity the lake would cover about 800 sq.miles. 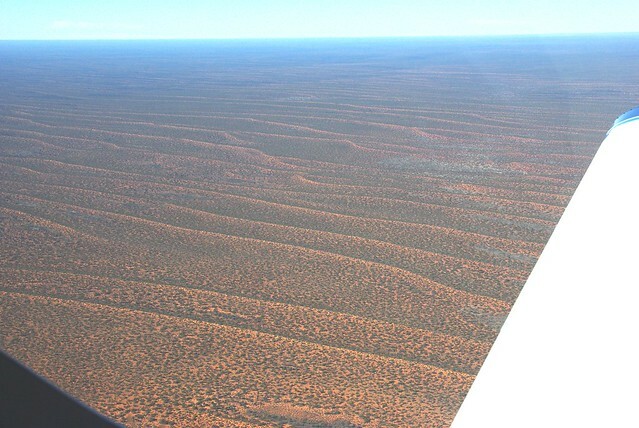 Continuing south into the Tanami desert, I flew around Wolfe Creek Crater. This was only discovered during an aerial survey in 1947. It's believed to be about 300,000 years old and was created by an estimated 50,000 tonne meteorite. 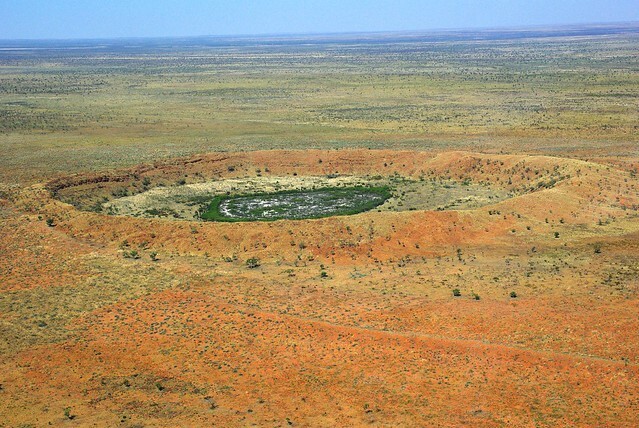 It's generally regarded as the second largest well-preserved and clearly defined impact crater after the Barringer Crater in Arizona. 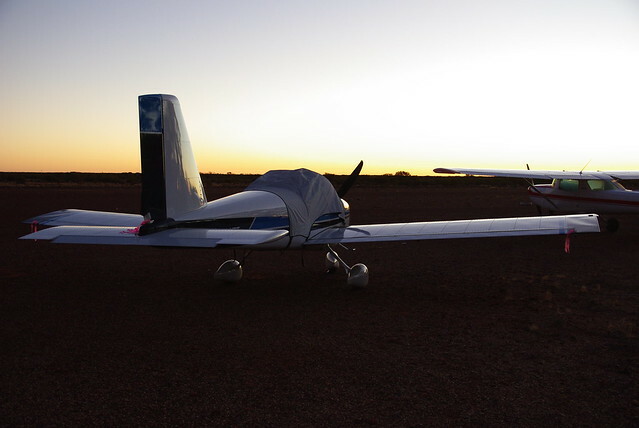 After landing at Halls Creek for an overnight stop, the next stage was a 3.5 hour flight across the Great Sandy Desert to remote Sandfire Roadhouse on the edge of the Indian Ocean. 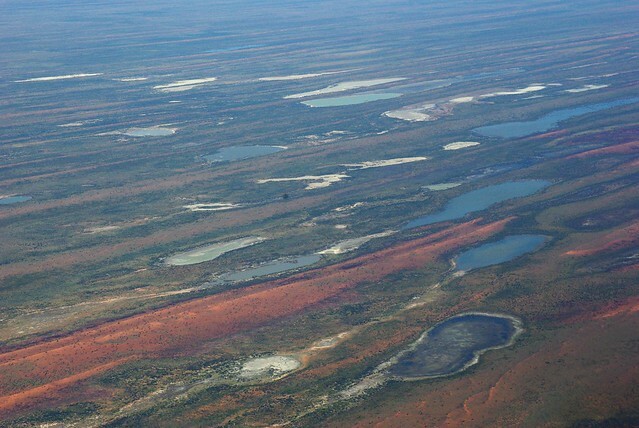 On the way, I flew over Fitzroy Crossing, one of the main towns in this part of the world - population about 1,200. 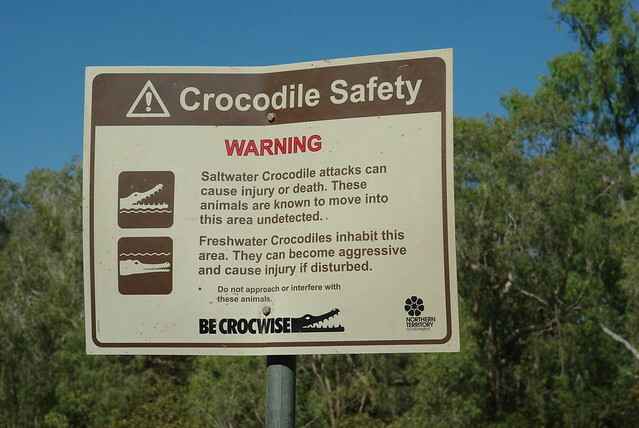 Although it's well inland from the ocean, watch out for the saltwater crocodiles. They live here too. 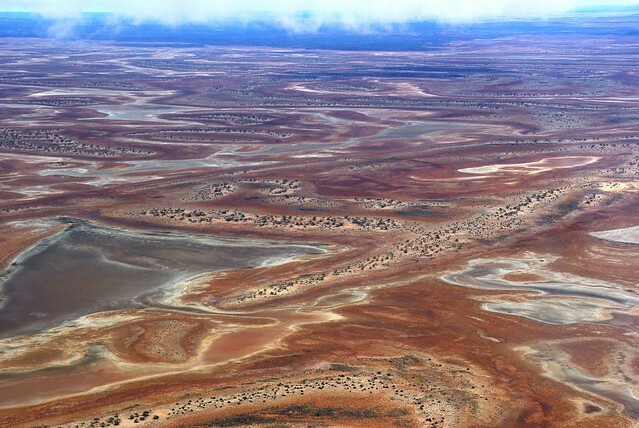 This is desert, remote and uninhabited, but the colours are often beautiful. ... with occasional salt pans to relieve the monotony..
Last edited by rgmwa : 08-05-2018 at 07:41 AM. 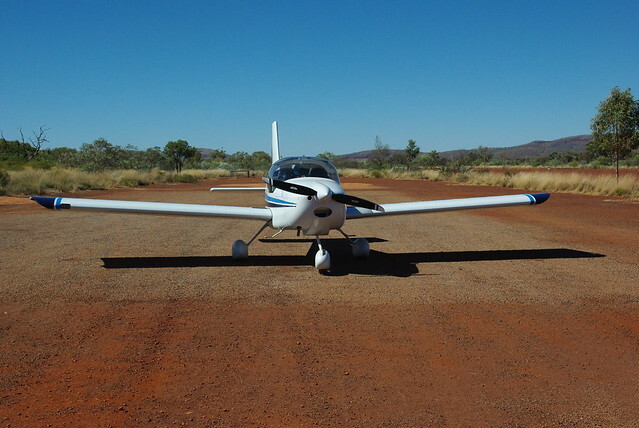 The flight to Sandfire Roadhouse across the desert was just as it should be - uneventful, and I landed on the gravel strip adjacent to the roadhouse (visible running diagonally on the far side of the buildings). A Beech Baron was parked in the bay as I taxied in. After landing I decided to taxi the plane up a convenient sand track to get closer to the fuel bowsers and so save several half mile walks carrying 70 litres of fuel in relays. It seemed like a good idea, and after clearing away bushes, odd bits of discarded machinery and other rubbish, I taxied the plane through the broken fence line and past various wrecked cars to an open area next to the roadhouse. All went well with the re-fuelling but then I bogged the plane in loose sand on the way back. It doesn't take much to stop an aircraft. However, luckily it wasn't too difficult to walk the plane out by chocking each main wheel in turn and using the convenient wingtip hand holds that the RV-12 has to drag the plane forward. 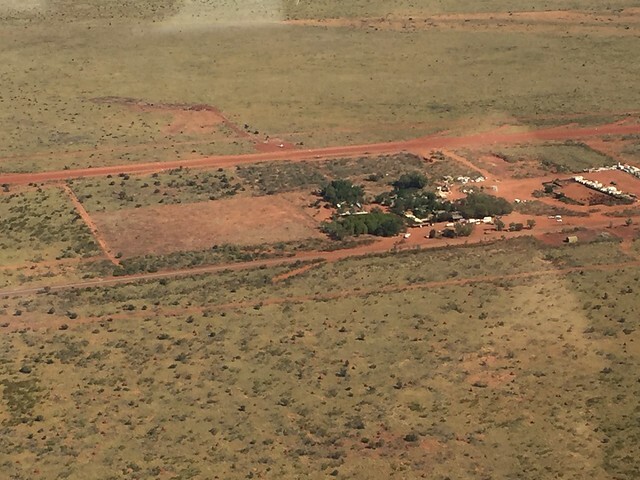 The next stop was a mining town called Paraburdoo, another 3.5 hour flght to the south. 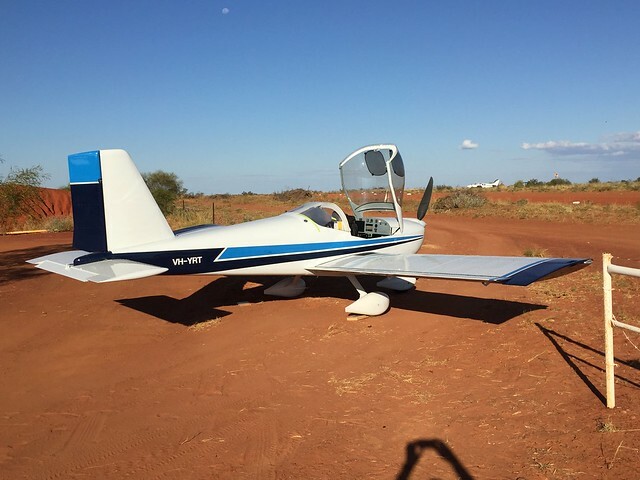 However, on the way I landed at the airstrip in Karijini National Park to have a look at the unique visitor's centre they have there. 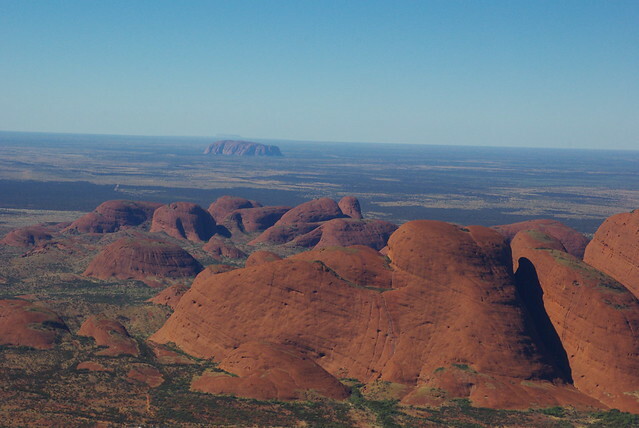 Made from special`weathering' steel, it rusts to form a protective coating, and takes on a deep red-brown colour which matches the colour of the rock formations in the area. 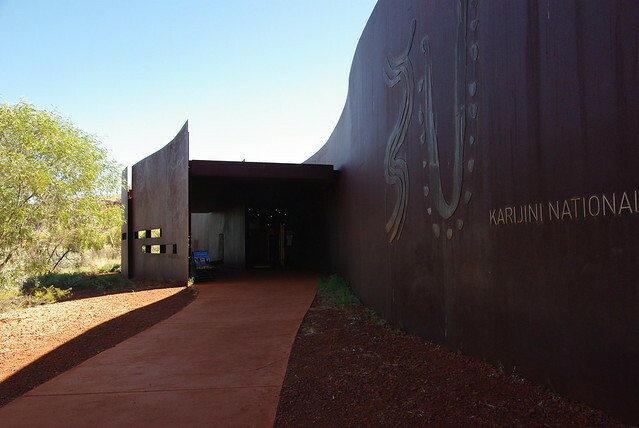 The design of the Karijini Visitor Centre building is representative of Banyjima Aboriginal culture. The shape depicts a goanna moving through the country with the tail representing Banyjima history, the head the future, and the centre representing Aboriginal law. I was particularly interested to see this building as in my day job as a structural engineer, I designed it back in the late 1990's. 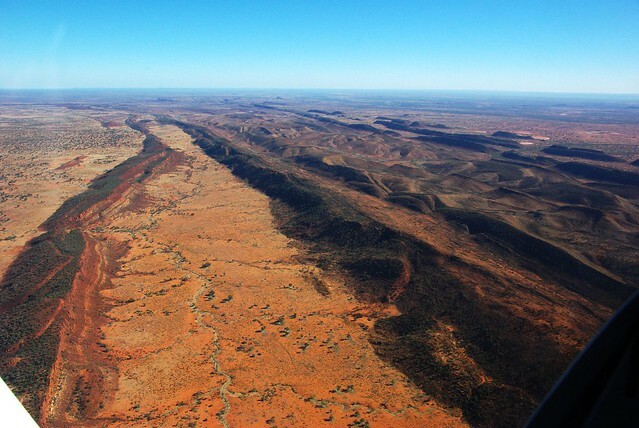 However, as Karijini is about 900 road-miles from Perth I never got the opportunity to see the finished structure until now, and certainly never thought I'd fly there in my own plane one day. Keep `pounding those rivets' as the saying goes. 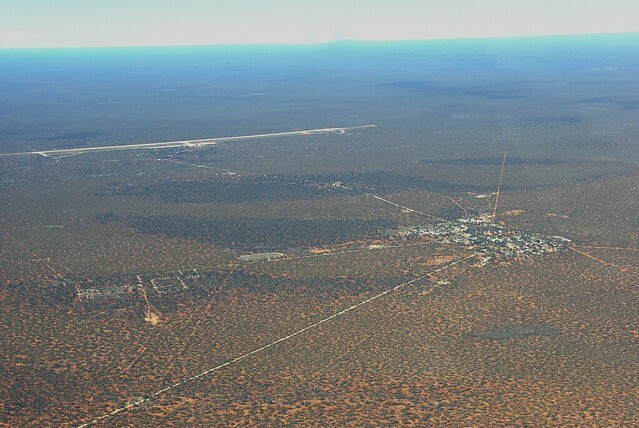 From Parburdoo, I flew south east across very rough country to a small town called Meekatharra. 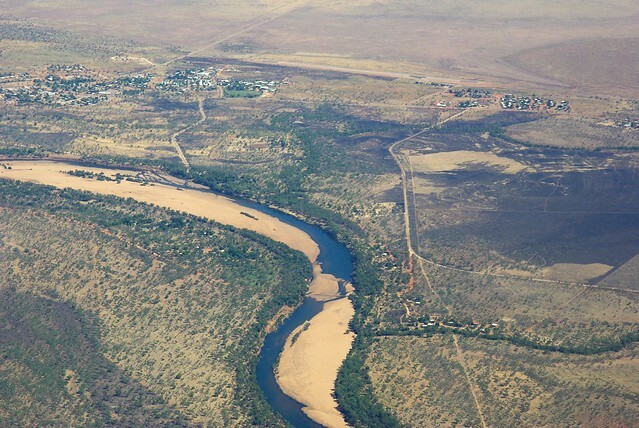 Nearly all the townships in this part of the country exist mainly due to iron ore or gold mining. 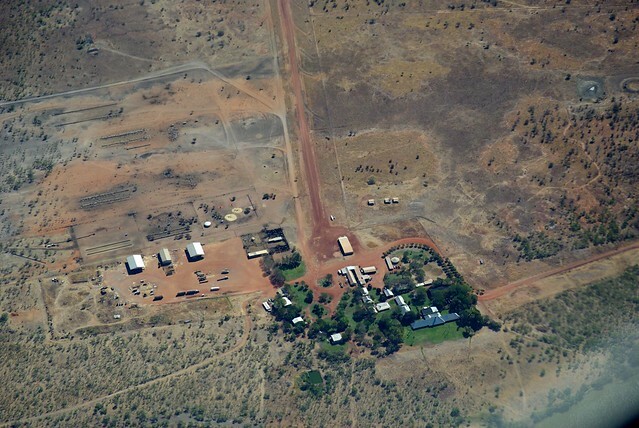 They typically have good sealed airstrips and small terminal buildings, although they don't always have re-fuelling facilities, so plan with care when travelling in these parts. 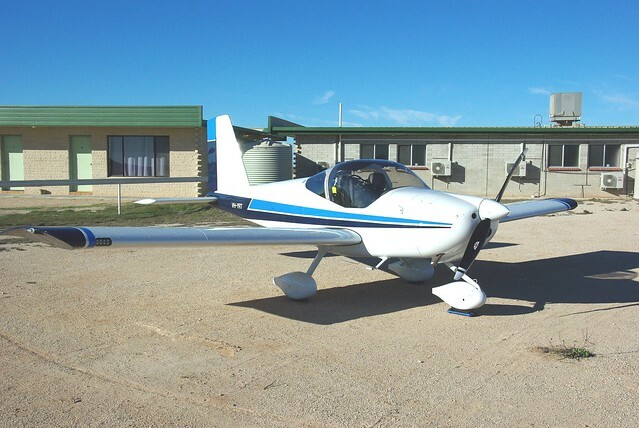 I had to delay for a day in Meekatharra as strong southerly winds associated with storms around Perth would have reduced my ground speed to about 75 kts. Then at 1:30 am that night, a sudden squall came through with rain and very high winds. It only lasted about 20 minutes, but I was seriously worried about the plane, which although securely tied down, was in the open on the airfield. Fortunately it was undamaged when I checked the next morning, although it had obviously moved around in the wind overnight. Now after nearly four weeks of fine weather, I was flying into extensive areas of low cloud and rain coming up from the south. However, by way of compensation, I flew over the first green landscapes I'd seen since leaving. 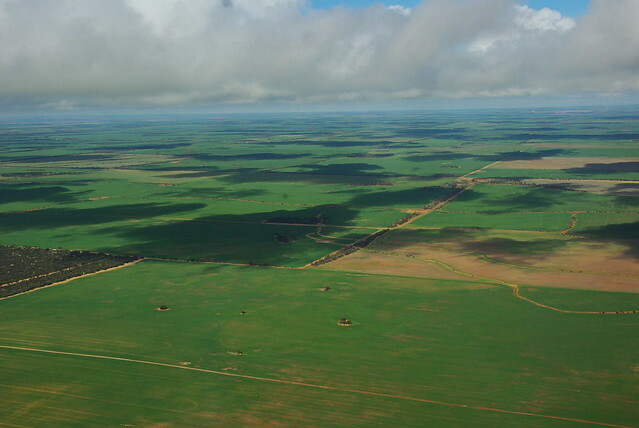 After refuelling at Northam, it was only an hour's flight over the Perth Escarpment to reach Serpentine airfield, although dodging low cloud and showers made for some interesting flying conditions. The flight added 45 hours to the Hobbs, and I used about 770 litres (202 galls) of fuel, 23% of which was avgas and the rest mogas. Last edited by rgmwa : 08-05-2018 at 12:23 AM. Interesting flight - well done. What cruise speed and power setting and altitude to do 45 hours on 770 litres? Thanks John. I averaged 17.2 lph overall, but that's misleading in terms of consumption airborne, which I estimate is more like 19 lph at 5200-5300 rpm. I generally flew between 3,500' and 6,500'. My still air range is about 450 nm with an additional 45 minutes reserve. Great info. I assume you plan/get 110knots TAS at that power and altitude? Rob you just reignited me. Couple questions for you. Other then visiting with the family do you keep the tab for those four weeks of travel? Would be interesting to know how much you spent on gas, accommodations and meals. You've covered half of the country. Were there any places on your route suitable for camping? Are there any predators other then crocodiles and wild bulls? Do you carry a firearm? John, I flight plan on 19 lph and 112 kts. I think that's pretty realistic at those power settings. Flat out my plane will do 128 kts straight and level at about 1000', but obviously prop pitch affects this. My tank will hold 98 litres, but I usually fill to 95/96 litres on these trips. For local flying, i don't bother with more than the standard 75 litres. At altitude and 5200-5300 rpm I will often see 118-120 kts TAS. The lowest level of fuel remaining was 24 litres after 3.5 hours take-off to touch down, so I see my endurance as 4 hours plus 45-60 min reserve. That's OK for these trips. The standard tank capacity of 75 litres is also manageable with the 912 ULS provided you carry spare fuel with you most of the time. The problem is you have to land somewhere to top up. The 912iS engine should perform better in terms of economy, even with the 20 gal tank.